Coming off a 5-0 victory against No. 4 Colgate at home, the Bobcats looked to build on that success against Cornell. 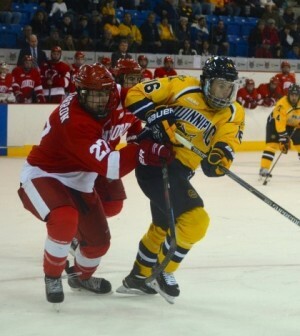 Quinnipiac started off slow, having to kill a five-on-three penalty in the first period. Senior Matthew Peca was given a five minute major and a game misconduct 5:52 into the second period for a hit from behind. Then, with less than two minutes to go in the third period, Tim Clifton broke the tie. Clifton banged in a rebound for the game-winner. Quinnipiac goalie Michael Garteig recorded 18 saves on the night. Garteig turned in his second-straight shutout with the win. Quinnipiac improves to 5-2-1 on the season with the win. The Bobcats are back in action on Friday, as they travel to Union for a 7 p.m. start.